BRANSON, Mo., September 26, 2012 — “We extend our heartfelt sympathy and condolences to the family, friends and fans of Andy Williams,” said Lianne Milton, co-owner of the Branson Tourism Center. “The voice, called by President Ronald Regan ‘a National Treasure,’ is silent, but its memory and impact on the hearts of those who heard it will live on for generations,” she continued. In reflecting on Andy’s career in Branson, Milton points out that when he came to Branson in 1992 he came not for the short term as simply an entertainer, but for the long term as a neighbor and member of our community. Prior to his opening in Branson, he published an ad in a local paper saying, “Andy Loves Branson.” They weren’t just words. 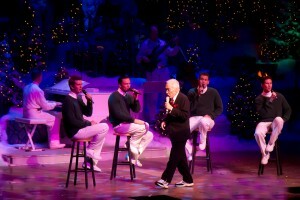 For the past 20 years, from his Branson performance schedule and his magnificent theatre to his many active efforts in promoting Branson, the stars he has brought to Branson, buying a home and living in Branson as well as his active participation in a host of charitable and community events, he has consistently shown just how much he cared about Branson. “Last night, Branson physically lost not only one of its premier entertainers, but a true friend and neighbor. What Branson did not lose, and will cherish forever however, is the blessing of the 20 years ‘we’ shared together and that out of all the places in this country where he could have chosen to build The Andy Williams Moon River Theatre and share his talents that he chose Branson, Missouri,” Milton concluded. This entry was posted in Branson Shows, Featured on September 26, 2012 by Gary Groman.